Nina Squire, pastel artist, Dorset – Pastel portraits of dogs, horses and people. I have a travelling studio – an easel, set of pastels and a flask of coffee and I’m happy. I’ll draw in an open field or warm cosy studio but prefer the bustle of people and the conversations they bring. I’ve enjoyed working at local events with my work displayed and working on a recent commission whilst people potter and chat. 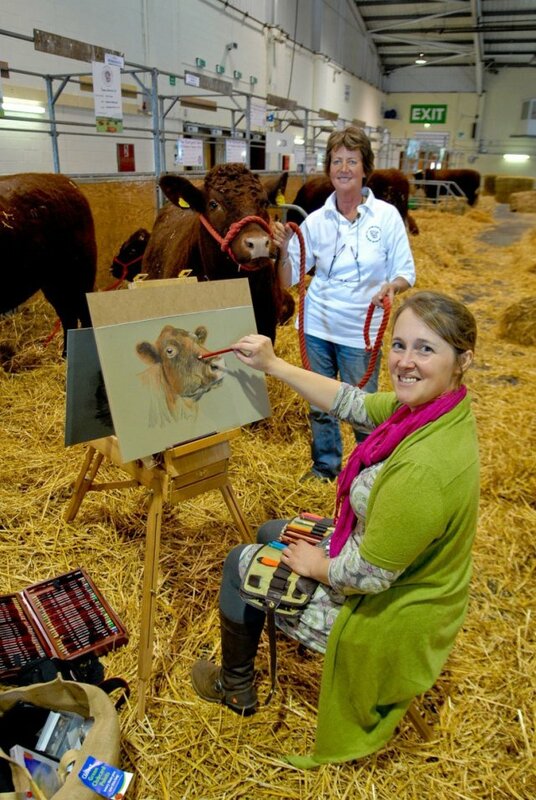 I’m pictured here at The Devon County Show, I was invited to draw in the show ground during the show. I’m well known for portraits of people’s pets but for me, it’s all about capturing a personality, creating something that looks real. With everything I paint I want the viewer to feel they can walk in or my subject is just about to jump out! I have a long standing collaboration with Stewarts Country Garden Centre in Wimborne. They are hosting me for the fantastic open Studio Event in May, Dorset Art Weeks. I’ll be working outside as the weather warms up! Please call if you are thinking of popping by, I’ll be able to give you an up to date schedule of when I’m drawing there. Stewarts have been collaborating with me on a lovely local project to help children learn about the importance of their environment though art workshops. We have more information on the Stewarts Little Green Fingers Blog or on my website here. I’m lucky enough to have my framer just down the road so when ordering your portrait you can chat to them about your framing needs. Its been a great development for us as nothing sets a finished portrait off as well as the generous mount and hand finished mouldings of a professional frame. Wimborne Picture Framers have a well respected reputation locally and I want to make sure that my pictures have the bespoke frame they deserve which makes them the long lasting focus of any room display. I work mainly in pastel but I have developed a range of styles to suit the variety required for commercial Illustration. I’ve been taking pastel pet portrait commissions for over 15 years and I am more than happy to take on a variety of subjects. My animal portraits in pastel are collected and treasured both locally and internationally. I paint commissions and exhibit throughout the South West, including Falmouth, Cornwall, Barnstaple, Devon and more recently Dorset and New Forest. My animal portraits aim to capture character and create a lasting memory to cherish. I like to meet the animals but equally can work from treasured photos. I studied illustration at Falmouth College of Arts and started working as an illustrator fifteen years ago. It has now developed into a range of commission-based work, recently including beautiful family homes, prize winning cattle and pets and family pastel portraits. I’m Artist in Residence at Larkhill Racecourse and regularly demonstrate my pastel painting and recently have been invited to be Artist in Residence at The Devon County Show and The New Forest Show. I take on many of my commissions for Christmas or special occasions, including weddings and anniversaries. Gift vouchers are an ideal gift to contribute towards a pastel portrait and the perfect idea for friends and family who deserve a special treat that lasts forever.